Lisel’s Ocean Rescue by noted children’s author Barbara Krasner, recounts the story of Liesl Joseph, a 10 year old girl aboard the ill-fated MS St. Louis. On May 13, 1939, together with her parents and 937 other Jewish refugees they left Germany on the MS. St Louis attempting to seek temporary asylum in Cuba. 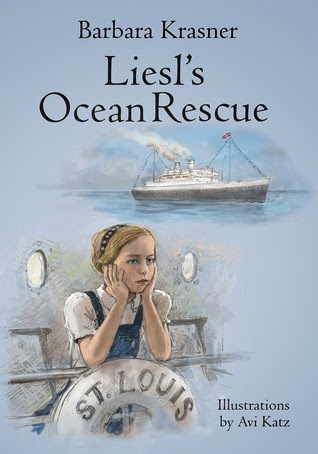 Liesl’s Ocean Rescue is a worthy and strong addition to Holocaust literature and curriculum at the elementary school level. The book provides an excellent bibliography of additional resources and will facilitate teaching of a difficult but necessary subject. The poignant and uplifting account should encourage our children to stand up for what they believe is right and to make a positive difference in the lives of those less fortunate. Liesl's Ocean Rescue speaks to a time when the world was in chaos and so many were just trying to survive. It's honestly a piece of history that I didn't know about until I picked up this book. The book, while an easy read, is geared more towards older children than younger. It tells Liesl's story in such a way that none of the more disturbing truths about that time come through so I promise that your child will not be traumatised, just a bit more knowledgeable. If I had any complaint about this book, I felt as if it were abrupt and would have worked better as a short chapter book than in the format that it's in. I did especially appreciate and enjoy the black and white art work that is throughout the book. I'm dubbing this one a great book for the history lover in all of us.